NBA Playgrounds is a fine-tuned blend of arcade basketball and competitive play. It has a tendency to lean on the former, but the 2-on-2 matches can get awfully tense in the final moments of a game, especially in more difficult matches against the A.I. The game strives to be a modern-day take on the NBA Jam formula, letting players leave realism and simulation at the door in favor of a faster pace. It doesn’t live up to the aforementioned classic, but it’s just fresh enough that it’s able to chisel a spot for itself among the short list of arcade sports titles on the current generation of consoles. More similar to NBA Street than anything else, Playgrounds focuses on a 2-on-2 style of basketball, leaving less clutter on the court and more time for pulling off Globetrotter-type moves. The concept is good, but everything about the game is just a little too stiff to live up to prior greats. Instead of being able to pull off ankle-breaking crossovers, players will often just take a side step or two for a little extra space. Running in circles seems just as likely to get you open as any kind of dribbling move, especially against human opponents who are rarely fooled by more jittery movement. If anything, the game tends to lack enough unique style. While the big-headed character designs and art style are terrific, players don’t have very distinct play styles. Every player has a series of ratings, ranging from shot blocking ability to 3-point shooting, and they scale on a range of 1-10. Just about every player has a high skill or two, but legends often mark high in several. It’s just enough to make them feel somewhat unique, even though their play style ends up feeling familiar. 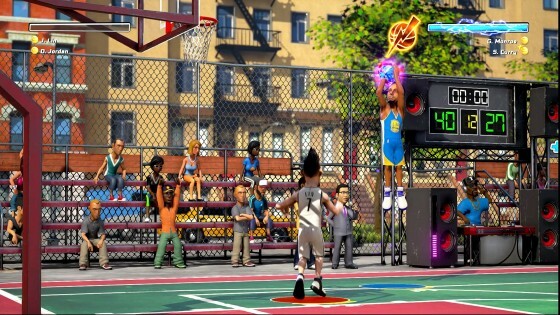 Ultimately, NBA Playgrounds feels like a slightly more nuanced Backyard-style sports game. It’s pretty simplified, which is good for pick-up-and-play purposes. Playing with a group of friends might be the best option, as four players at once can lead to some chaotic fun. The A.I. definitely holds its own, but games have a tendency to feel redundant after a while. Unfortunately, by the third or fourth tournament, the game has little else to offer but its challenge. Fortunately, the challenge should be enough to propel players forward. It’s reminiscent of sports games of old where defeating some of the game’s best challenges became a rewarding experience. It can be frustrating, however, when the CPU hits 10 shots in a row, all the while stealing everything within grasp. You eventually have to find creative ways around it, which can be a good or bad thing depending on what you want out of the game. Unlocking new players comes via an all too familiar card pack system. Each time you level up, you get a silver pack (each with five cards). If you win the entire tournament, you get a gold pack (which are more likely to contain legendary players). If there’s anything that will hook players into Playgrounds for the long haul, it will be the idea of collecting all 250 available players. There are quite a few interesting names in there, including Bill Russell, Spud Webb, Magic Johnson and Allen Iverson. The game has an online matchmaking mode, but it should be noted that because I played the game on Nintendo Switch, I haven’t been able to experience it. 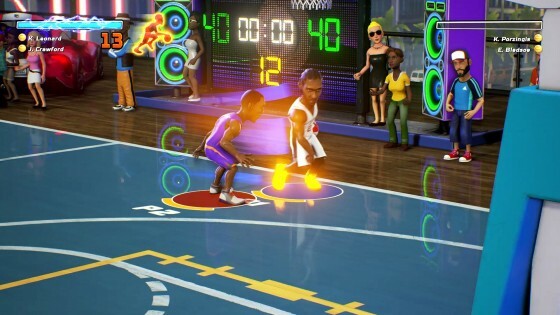 Saber, the developer of NBA Playgrounds, has promised that this feature would be patched in within days of launch. That being said, NBA Playgrounds might function best as one of the few sports games you can take on the go. Its 2-on-2 style is perfect for mobile gaming.